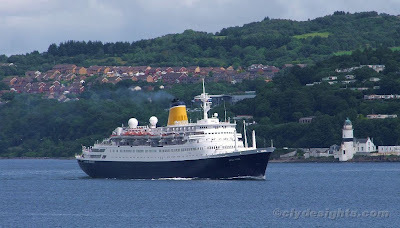 Paying a last call to Greenock, the veteran cruiseship SAGA ROSE was seen passing Cloch Lighthouse on Wednesday afternoon, as she made her stately way down the Clyde and on to Liverpool. Her final cruise will leave Southampton on 30 October and take her on a 37-night venture around the Mediterranean. On arrival back at Southampton on 6 December, she will be retired from the Saga fleet.